The National Association of Medical Education Companies, Inc., (NAMEC) is a professional association dedicated to providing representation, advocacy, and education for its members. NAMEC is incorporated in the state of Maryland and is recognized by the Internal Revenue Service as a 501(c)(6) organization. 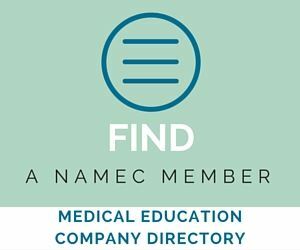 Looking for a list of continuing medical education companies? Contact us. Interested in marketing to the CME community? Consider advertising with NAMEC.